Do you grill your corn on the cob? 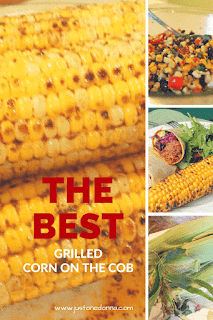 Today I'm sharing my favorite grilled corn recipe and the timing for this recipe couldn't be any better. As I look forward to the upcoming grilling season, I can't help but think about how delicious corn on the cob is when grilled. I bet if you grill your corn on the cob you'll never want to eat it any other way. With Memorial Day and Fourth of July picnics in our future, what side dish do you automatically think about having? Well, it's corn on the cob, of course, made even better with chili-lime butter. Grilling corn on the cob is as easy as can be. There are many ways you can cook your corn on the grill. Some suggest grilling corn on the cob in the husk or wrapped in foil or straight up on the grill. I always choose to grill my corn straight on the grill because I want a bit of grilled flavor added to my corn as a flavor base before adding my favorite chili-lime butter to season it. Plain butter is fine, but adding the chili-lime butter will take your corn from good to great! Make some chili-lime butter today and keep it in your freezer so it will be ready when you need it. Mix the butter, juice of one lime, lime zest, cilantro, chili powder, garlic and black pepper together in a small bowl until well combined. Place the butter mixture on a piece of wax paper. Roll the butter mixture into a log shape, twist the ends and refrigerate until chilled and the butter is solid. Are you ready to grill your corn on the cob? You'll want to preheat your grill to get it good and hot. I use a gas grill, but a charcoal grill works as well. While your grill is preheating, remove the husk and the silks from the corn. Some people like to keep the husks attached. If you do, you'll want to soak the husks in water before you grill so they don't burn to a crisp. I think it is easier just remove the husks completely and toss them in the compost before grilling. Rub the each cob of corn all over with olive oil. Don't bother to add any flavoring at this point. The flavor will come from the chili-lime butter after the corn is cooked. Place the corn directly on the hot grill over high heat; rotating it frequently so no one spot is overly charred. It will take about ten minutes to cook the corn and you'll want some of those tasty kernels to be blackened. Those little, charred spots will give your corn its delicious grilled flavor. Once the corn is cooked, place it on a serving platter and slather it with the chili-lime butter. Add a sprinkling of kosher salt and a couple of twists of fresh ground pepper and you are good to go. 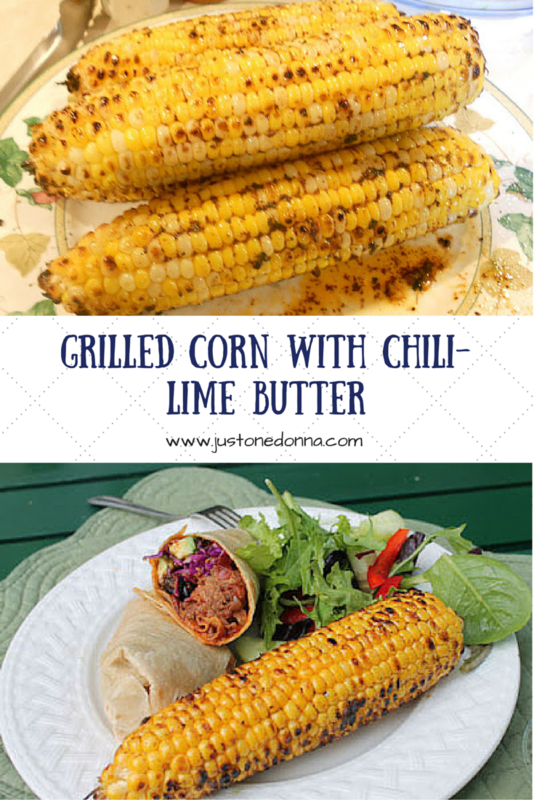 Yummy grilled corn with chili-lime-butter! Enjoy some this weekend. You can also use the chili-lime butter in this recipe for Cumin-Rubbed Steaks. Before you go... Never miss a Just One Donna post by signing up to receive posts in your email or your favorite RSS feed. Links are in the sidebar. This looks so good! I've never grilled corn before but I might need to try! Tricia, grilled corn on the cob is the best! Try it and you'll never want it prepared any other way. Donna, this looks yummy. Corn on the cob is my husband's favorite. I will try it. Hi, Vicki. This recipe kicks ordinary corn on the cob up to amazing! Your butter recipe sounds delicious, it would go well with the corn or other vegetables. This butter is also delicious on top of grilled beef, chicken or fish. Just add it at the end of cooking to melt over the top. Yummy!